Most of us can probably think of innovations that seemed like a good - even inspired - idea at first blush but turned out to be mediocre or worse in actual use. Much better are concepts that seem perhaps clever at first, but questionably practical, yet play out much better than we expected in real world service. The latter is the case with Targus Touch Scroll technology, which is used in the new Targus for Mac Wireless Mouse, Bluetooth Laser Mouse, and Bluetooth Presenter products. 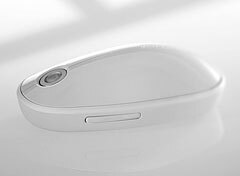 Touch Scroll replaces the traditional mouse-top scroll wheel (or trackball) with a solid state optical sensor that allows 4-way scrolling using fingertip gestures in the desired direction over the optical sensor. This sounds like an interesting idea, if a bit gimmicky. However, the more I use the Targus for Mac Wireless Mouse, the more addicted I've become to Touch Scroll. I had been happily using the Logitech V-550 Wireless Mouse for a couple months prior to the "for Mac" mice arriving, and it is a choice piece of equipment with a very comfortable feel, accurate tracking, and the finest scroll wheel I've yet encountered. When I first checked out the Targus mice, their feel, while nice enough, didn't grab me immediately the way the the V-550 had. At first I found the sort of humpbacked, center-ridged shape a bit off-putting (it's actually very attractive visually), although I do like large mice, which these are (exterior dimensions: 2.51" x 1.45" x 4.64"), and the Touch Scrolling would definitely take some getting used to. However, get used to it I did, and after a week or so the shape of the Targus mice also begin to make sense and feel quite comfortable as well. They have always been smooth customers on the mouse pad, gliding about almost effortlessly, which is no mean engineering achievement for a wireless mouse packing two heavy AA cell batteries. The left/right click buttons also have a nice, light (but not hair-trigger) positive action. And as I've related, Touch Scroll is seductive once you (quickly) get to the stage where it becomes intuitive. Brushing your finger across the smooth optical scroll scanner surface feels natural and effortless and is the best solution to horizontal scrolling I've experienced. They Logitech V-550 also supports horizontal scrolling with sideways nudges of the scroll wheel, but it's not nearly as slick as Touch Scroll for that - and also requires installation of Logitech's Control Center driver software, while the Targus for Mac mice don't (you do need proprietary Targus driver software in order to use the to programmable buttons configured in a rocker switch on the lower left of the mouse housing). Personally, I find two buttons ample for my needs and prefer to not load up a lot of third-party drivers if it's avoidable. For example, the Logitech Control Center has a conflict with my favorite production application, Tex Edit Plus, so I prefer to pass on the features not supported by the default Mac drivers, which unfortunately includes horizontal scrolling. The Touch Scroll is also great for breezing through long documents, and while I'm not a spreadsheet user, I can appreciate how much easier horizontal scrolling will be for working with spreadsheets. I also prefer will look of the Targus for Mac mice to the V-550, which is handsome enough in a conventional way - but nothing extraordinary. 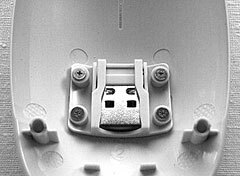 The Targus units styling I would describe as "retro-futuristic"" like some of the hardware seen in, say, 2001: A Space Odyssey 40 years ago. The color theme of the entire Targus for Mac line is called "Lunar Grey" quite appropriately. The Touch Scroll sensor itself reminds me very much of the "eye" of the HAL 9000 rogue computer in Stanley Kubrick's 2001, especially when it glows red, and I would be interested to know if that's coincidental or if HAL played a part in inspiring the designer. 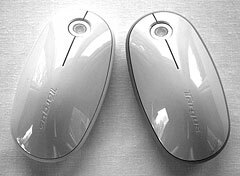 As I mentioned, there are two Targus for Mac mice - the Targus wireless Mouse, which uses a 2.4 GHz RF interface requiring a USB receiver dongle at the computer end, and the Bluetooth Laser Mouse, which connects via Bluetooth. Other distinctions are that the RF unit has a 1,200 dpi optical sensor, while the Bluetooth model gets a 1,200 dpi laser sensor. Other than that and the Bluetooth model's two-tone livery with Lunar Gray over a darker grey lower case, the mice are identical in form factor. Personally I've never found a Bluetooth mouse that didn't drive me nuts with response latency, and the Targus for Mac unit is no exception to this. The laser sensor may be considered superior to the optical unit in the RF version, but it's kind of hard to tell because of the Bluetooth response lag. While it is a pain to have to occupy a precious USB port with a receiver, especially on a laptop (the low-profile receiver unit can in most cases remain in situ for transit or storage and stores in a slot inside the battery bay when removed), RF Wireless Mouse is far and away superior in tracking response precision, and I have been able to detect no latency at all with it. It's also right there almost immediately when you wake the computer from sleeping (in fact, nudging it on the mouse pad will wake the machine), as opposed to the Bluetooth unit, which has to dither and collect itself while reestablishing a connection. The RF mouse is also truly plug-and-play, while with Bluetooth you have to muck about with device detection and pairing. And the RF wireless model is $20 cheaper as well. Definitely my choice, but some folks like Bluetooth, so whatever your preference, Targus has you covered. As mentioned, the Targus Bluetooth Wireless Presenter for Mac also incorporates Touch Scroll tracking. Briefly, the $79.99 Presenter is pitched as a remote presentation controlling device and cursor controller with more versatility and features than the Apple Remote. The Targus Bluetooth Laser Mouse for Mac retails for $69.99, and the Targus Wireless Mouse for Mac retails for $49.99.